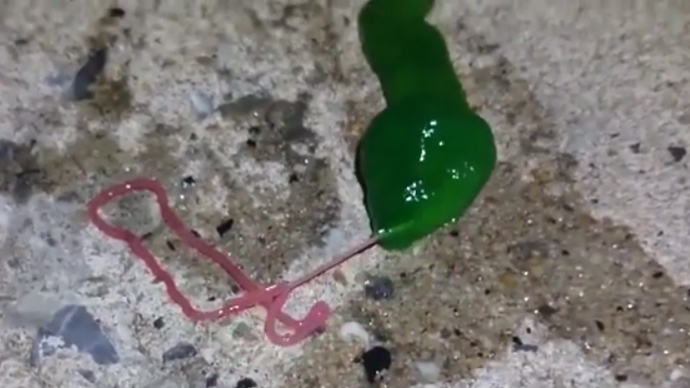 A man fishing in Taiwan has caught a green, creepy-crawly worm-like creature with an overlong pink tongue. Wei Cheng Jian captured the monstrous specimen in the port of Penghu on film and posted a video online for viewers to speculate about its origins. It has not been determined what it is exactly that Wei caught, but many Facebook users reckon the alien-like creature looks like a ribbon worm (phylum Nemertea). Most nemerteans are carnivores, feeding on clams and crustaceans. They move slowly, using external cilia to glide on surfaces. Slim and skinny, bodies flattened, ribbon worms are usually only a few millimeters wide. They tend to grow to about 20 centimeters long, but one particular specimen was estimated at 54 meters long. According to Smithsonian.com, ribbon worms vary vastly in shapes, colors and sizes, and can be as long as 60 meters - longer than a blue whale. Some live in the open ocean, while most settle in seas to find hiding places on the bottom. About a dozen species inhabit freshwater, mainly in the tropics and subtropics, and a few choose to hang out on land in cool, damp places.